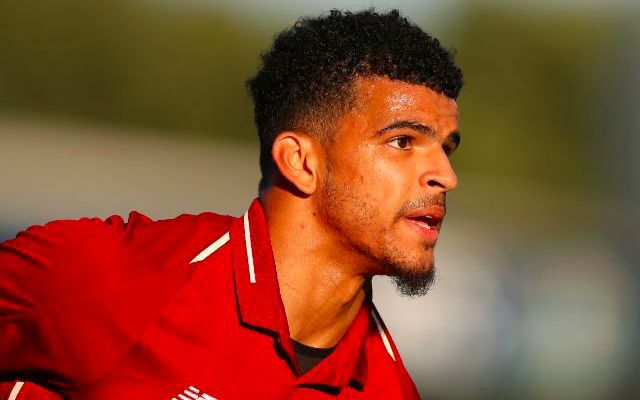 Crystal Palace have turned their attentions to Dominic Solanke as they seek to bolster their attacking ranks during the January transfer window. Roy Hodgson’s men look in dire need of added scoring prowess having fired a measly 14 goals in the Premier League so far this season. Talisman Wilfried Zaha is without a goal in his last 10 league appearances, whilst Christian Benteke has been out with a knee injury since the first day in September. Having often resorted to deploying Andros Townsend as a striker beside Zaha of late, Hodgson is now eyeing a move for a more orthodox goalscorer to lead the line. Palace are targeting a loan move for Solanke as they prepare to work with limited funds upon the turn of the year, according to the Evening Standard’s Giuseppe Muro. Steven Gerrard is also said to be interested in bringing the 21-year-old to Rangers having signed both Ryan Kent and Ovie Ejaria, who recently returned to Liverpool, on temporary deals during the summer. Solanke is yet to make a senior appearance for Liverpool in this campaign and has managed just two league outings for Neil Critchley’s U23s – both in which he scored. His best spell arrived in the most recent international break when he found the net four times in two games for England’s U21s. The opportunity to grant him regular top flight football seems a no brainer in regards to the Reds assessing his first team credentials ahead of next season. A move for Solanke would likely rule out a midseason exit for teammate Divock Origi as Klopp strives to retain viable backup options beyond the winter. It may not quite have happened for the Englishman just yet, but there is a predatory striker’s instinct to be unlocked from somewhere.